The Daily Deal Complex: Will Groupon and LivingSocial Work For Your Operations? Less than half of businesses running a daily deal promotion for the first time report profiting from the deal, according to May 2012 results from an ongoing Rice University study of deal websites such as Groupon and LivingSocial. But the study also shows that profits increase for businesses with more deal experience, while about 80% of deal buyers are new to that business and one-third become repeat customers. By giving deal buyers at least 50% off services, these sites are not engineered for businesses to make a profit on every coupon purchased. They are a marketing tool. These sites only take profits on deals that are sold, so you don’t lose anything if no one buys your deal. But with an average commission of almost 45%, according to the Rice University study, their cut is steep. You may have heard about the woman who sold more than 100,000 cupcakes through a daily deal site and spent a year’s worth of profits trying to serve each one. So how do you avoid that type of story and pull off a successful daily deal promotion? As seen in this screenshot of an archived deal on Groupon, deals offer at least 50% off services and products. MPG Car Rental in Los Angeles offered the standard 50%. All the operators interviewed report that daily deal companies help guide you through the deal process. And since a few horror stories broke headlines, the sites are sure to vet your company. Groupon, for example, will check your Better Business Bureau listing for any negative reviews. The site also checks Yelp reviews, according to Paul Hernandez, manager of MPG Car Rental in Venice, Calif., which offered a car rental deal on Groupon. Ryan Safady, co-CEO of luxury rental company Imagine Lifestyles, says Groupon checked his whole system, down to how many dates he had open for reservations. Though some initial pains were felt during one of the first deals offered, “we made sure to maneuver them now in a way it doesn’t take away from our normal business,” he says. In the luxury and exotic space, Groupon and companies that have done deals say that offering an experiential package is the most successful. Imagine Lifestyles' Ryan Safady says his company has found that these deals work best because it doesn't interfere with regular renters. And that’s the learning process. While daily deal sites help you create the deal, only you can figure out what succeeds specifically for your business. For example, Hernandez says that Groupon helped him figure out his deal’s pricing structure, showing him that tiered pricing works the best. MPG Car Rental quickly learned, however, that while the tiered pricing structure worked, a two-tiered structure would be best — keeping deal values equivalent to MPG’s price for a one- to three-day rental at the most. “Capping the deal” is an important first step in the process. MPG Car Rental capped its deal at around 100, which was sold in December 2011 with a one-year expiration date. Those 100 people have been trickling in, Hernandez says, and as of this writing, 30 of those deal buyers had not yet used it. ACE Rent-A-Car has also played in the daily deal space, but for its new parking brand in Indiana and Illinois, Easy Airport Parking. Kevin Stutz, business manager for ACE Reservations Systems, says that the Groupon parking deal sold in July was capped at 1,500 purchases and managed to sell out. 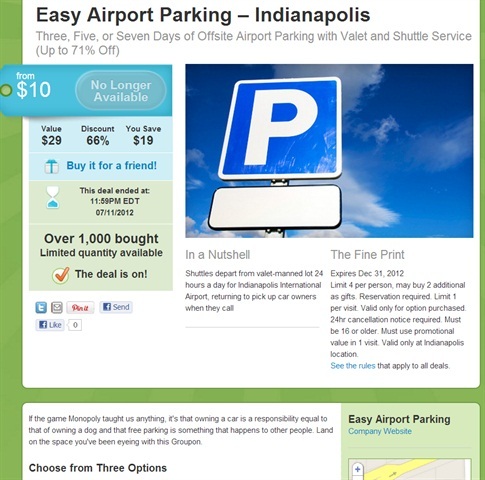 ACE Rent-A-Car's new parking brand, Easy Airport Parking, in Indiana and Illinois has done one Groupon deal so far. Kevin Stutz, Ace Reservations Systems business manager, says he wishes the company had done more of them sooner. For new brands such as Easy Airport Parking, daily deals can be the perfect marketing tool. “It exposed us to an entirely new demographic of people,” Stutz says. And while it’s too early to tell the success of the campaign, he says the promotion has been going without a hitch. “The fact that it sold out and we got through the busy month without problems means we passed the test with flying colors,” he says. Stutz acknowledges that there were concerns going into the deal. “The last thing we want to do is have so many Groupon customers coming through the door that we can’t properly service our loyal customers,” he says. So how do you calculate the number of deals that should be sold? Groupon reports that most deals are cashed in during the first and last months of the offer, with about 20% coming in the first month. Avis has done three different deals on Groupon for corporate and licensee locations. Above is a screenshot of one of the companies offers. ACE is still narrowing in on how a deal could be successful for daily car rental, Stutz says, because as an affiliate company the logistics gets complicated. To do a Groupon deal, for example, the offer must be a fixed price. “The problem with the car rental market is that pricing fluctuates so wildly,” he says. For Hernandez at MPG, being an independent car rental company offering electric vehicles and hybrids helped in selling his deal. He says it’s important to use any unique points about your company in the deal’s description. “When you really explain your business and what you’re about, you will have a higher repeat customer percentage and the type of clientele you really want,” Hernandez says. Yelp is also a favorite of MPG, and because it is a review site, the company is more likely to get a review out of it. “We get so much business through Yelp just because of our good reviews,” he says. Major car rental companies have offered deals for regular car rentals, including Avis, which has offered three Groupons, according to Avis spokesperson Alice Pereira. In its campaigns, Avis has offered deals during the off-peak periods before and after summer. 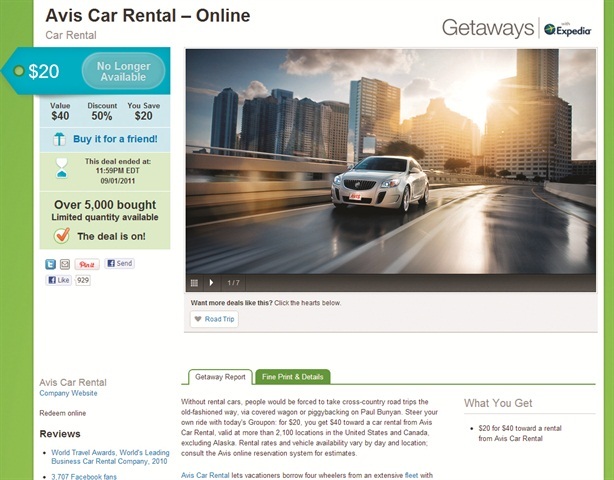 Groupon buyers could purchase a $20 certificate that got them $40 toward an Avis rental. The certificates were valid on rentals of two or more days but could be used on any car class at all corporate and licensee locations in the U.S. and Canada — except for Alaska. “We are very pleased with the results of the Avis deal on Groupon,” Pereira says. Using the deals to help keep utilization high is also a strategy for Safady. He says that while you’re getting less for that car, it’s still additional revenue compared to cars sitting on the lot. However, Safady says it’s important to be very specific in the wording of the deal and to be sure to “set aside” vehicles when running a daily deal promotion because you do not want to interrupt your regular flow of customers. For example, the first deal Imagine Lifestyles offered gave customers the option to drive a Ferrari or Aston Martin for one hour with a driving instructor. He says that at one point, every Groupon customer seemed to want to drive the Ferrari and became upset if it wasn’t available. 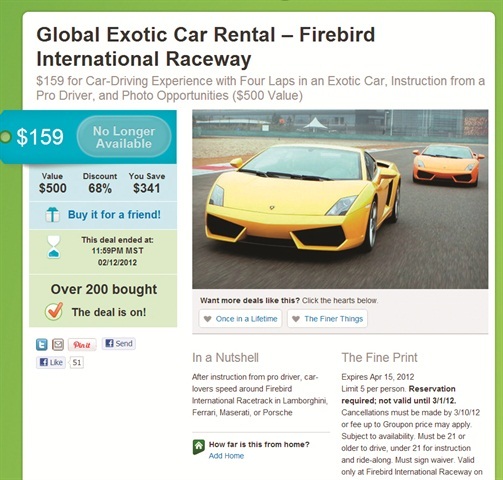 Screenshot of an archived Groupon deal from Global Exotic Car Rental. The company has done four deals so far and usually offers deal "experiences." 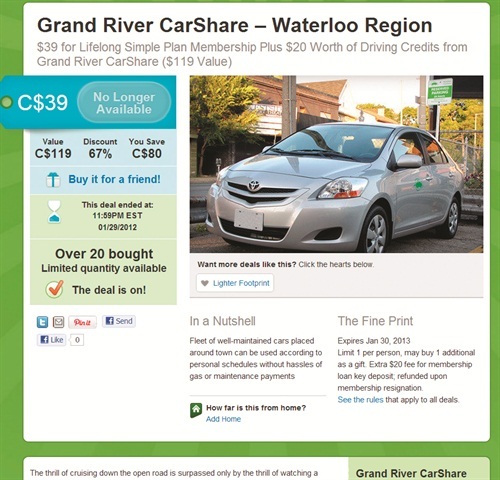 Car sharing companies are also often seen offering discounts on daily deal sites, such as this archived deal from Groupon given by Grand River CarShare. These types of experience deals are also encouraged by daily deal sites. “We’ve only done the regular car rental promotion once, and at this time we don’t plan to do it again,” Matarieh says, adding that Global Exotic has so far done four Groupon deals. In another creative look at offering daily deals, nonprofit car sharing company Grand River CarShare, based in Kitchener, Ontario, Canada, has offered multiple deals. Matthew Piggott, Grand River CarShare member services coordinator, says that Grand River’s deals are more successful each time. The membership-based car sharing organization has learned to not only offer a discount on the membership, but to give a few free additional hours of driving time. Getting people into the car and using the service has resulted in more driving by these customers and subsequent membership renewals, according to Piggott. “Anyone offering a membership service has it made because once the person buys it you’ve got them in,” Piggott says. “But the additional challenge for the membership system is to get them to actually keep on using the car share.” He says that Grand River’s deals also offer various rate plans. Another plus for Grand River is that it doesn’t have to worry too much about a deal cap. This is because as a nonprofit, Grand River has partnerships with various businesses and organizations throughout its operating area, giving it immediate access to extra parking. Piggott says that it’s those fixed parking costs that would be the most difficult to plan in accommodating a quick surge in membership. You have to do some work to make the deal successful. For example, Grand River had to make some website investments after the influx of traffic crashed the site during its first Groupon offer. “We got the site back up and with some additional space (bandwidth),” Piggott says. It’s also important to think about how you can market the deal yourself, such as sending an email to customers or annoucing it on your social media accounts. While offering discounts directly through social media platforms like Facebook and Twitter can be difficult to manage — as reported by the operators in this article — you can at least use these platforms to market the deal. Though it may seem counterintuitive to market the deal to current customers, it might also be a chance for you to thank your social media followers. It’s also important to track the analytics the daily deal companies provide you. Hernandez, for example, says MPG unexpectedly sold Groupon deals to customers from New York and San Francisco to all the way from Germany. While for Grand River, Piggott says the data “reconfirmed” the demographic interested in car sharing. Remember too that you are in essence buying a targeted list of emails, and those that buy can now be added to your own database — they have after all shown an interest in your business. So do your duty to get their email and other relevant information. Piggott says that Grand River has been operating on the assumption that the high retention rate is because daily deal customers were “on the fence” about joining a car sharing organization. “We convert people,” he says. 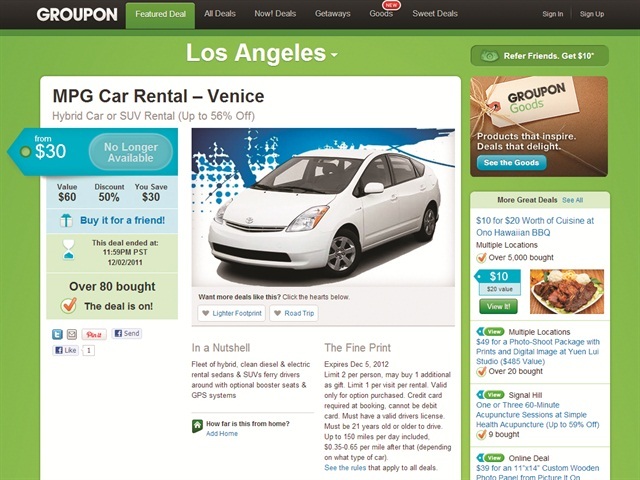 Groupon.com — Started in 2008 and now provides deals in about 48 countries. Focuses on its customer service with the businesses it deals with and Groupon buyers. 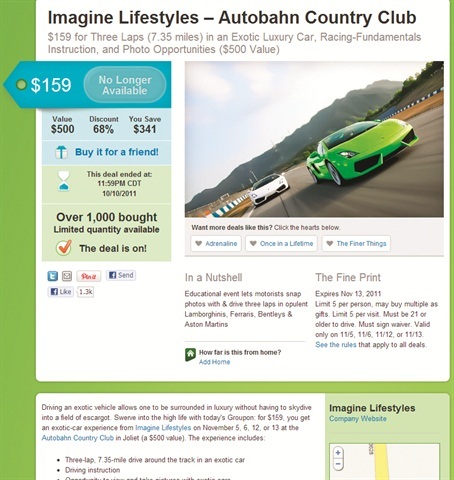 LivingSocial.com — Started in 2007 and reports 70 million members in a total of 19 countries. Focuses on deal sharing, in which members can get the deal for free (paid for by LivingSocial) if they get three others to buy the deal. Yelp.com — Started in 2004 and reports 78 million monthly unique visitors. Focuses on reviews, in which Yelp users have written more than 30 million local reviews, according to Yelp. Other sites include: SharingSpree, Retail-MeNot, Dealster, Eversave and AmazonLocal, among many others. See other ARN articles from the November/December magazine issue here.